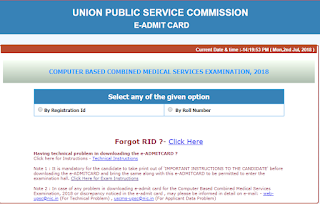 UPSC CMS Admit Card 2018: Union Public Service Commission has released UPSC CMS Admit Card finally!!! UPSC CMS Admit Card Download Link is available for the enrolled contenders for UPSC Combined Medical Service Examination, scheduled to be held on 22nd July 2018. Candidates can download UPSC CMS Hall Ticket either by entering their registration number or roll no. In order to acquire more details about UPSC CMS e-Admit Card or downloading UPSC CMS Admit Card 2018-19, you need to check this page as soon as possible. 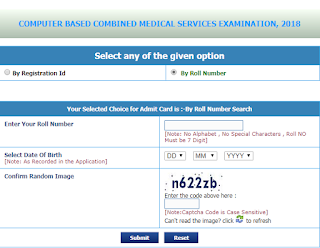 For Downloading UPSC Combined Medical Service Examination Admit Card, the candidate must have his/her vital parameters like RID & Date of Birth or Roll No. (if received) & date of birth or name, father's name & Date of Birth available with him/her. Below provided Steps to download Admit Card can help you to check UPSC CMS July Exam Admit Card. Applicants are required to open official web site of Union Public Service Commission i.e. www.upsc.gov.in. After reaching at homepage, candidates need to select “Admit Cards” tab which is available at right side of page. Thereafter, a page will appear on your screen with various links of UPSC Admit Card. Now, you need to hit the related link of UPSC Online CMS Admit Card which is given below. 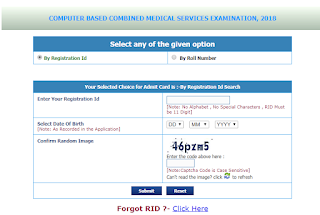 Select “Computer Based Combined Medical Services Examination, 2018” and hit “Here” link. Then, fill asked details in blank textboxes for downloading UPSC CMS Exam Hall Ticket. Now you have to choose one of the given procedures for UPSC CMS Hall Ticket Download. Enter the asked details in UPSC CMS Admit Card and recheck it. Subsequently hit the “Submit” button and your UPSC CMS July Exam Admit Card will appear on your screen. Download it and get printout of UPSC Combined Medical Service Exam Admit Card, keep it safe for UPSC Exam. The examination for Combined Medical Service for two objective papers will be conducted in Computer based mode. Applicants should note that there will be penalty (Negative Marking) for wrong answers marked by a candidate in the Objective Type Question Papers. The end date to apply for UPSC CMS 2018 Exam is 25-05-2018 and all the applicants are required to provide valid and active E-mail id while filling up UPSC CMS Online Application Form as the Commission may use electronic mode for contacting them. If any candidate appears at a centre other than the one indicated by the Commission in his/her UPSC CMS Exam Admit Card, the papers of such a candidate will not be valued and his/her candidature will be liable to cancellation. If a candidate does not receive his/her Union Public Service Commission CMS Admit Card or any other communication regarding his/her candidature for the examination, he/she should at once contact the Commission. Information in this regard can also be collected from the Facilitation Counter located in the Commissions office either in person or over phone Nos. 011-23385271/011-23381125/011- 23098543. Applicants can visit its Official Link to download additional information about UPSC CMS Admit Card 2018-19. Keep continue on our web portal and get latest updates about UPSC Hall Ticket, results etc.